Today’s article subject spawned from a discussion that began in the QS Discord chat. One of our members was contemplating stepping away from the game for a while and wanted to know the best place to park his money and/or what to trade into. As expected, a lot of people immediately jumped to Power. The general consensus among most people in the Magic community is that Power is the safest investment you can make. As more players get older and have more expendable income, it makes sense that they would be willing to purchase the most iconic cards from the game’s history, and thus the prices continue to rise. All pieces are on the Reserved List, so we don’t have to be concerned about Wizards of the Coast reprinting them. They are banned in all sanctioned formats except Vintage, though they are played in the Old School/93-94 format, and Timetwister is legal in Commander. However, that should immediately throw up a bit of a red flag. The most expensive non-premium Magic cards in existence are legal in barely any formats. 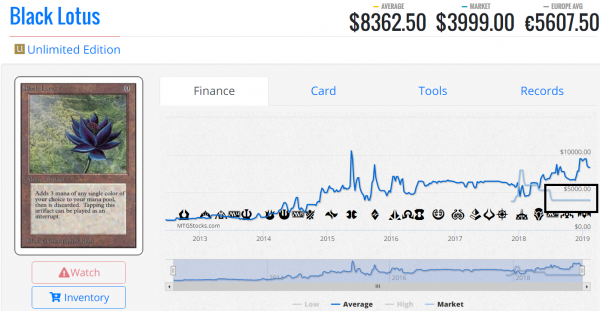 Now the beauty of Magic: The Gathering is that it is both a card game and collectible, so much of this demand could be attributed to collectors. If that is the case, then we would expect the NM or graded copies to command a huge premium over non-NM/graded copies. This tends to be the case—HP/MP copies go for around 35-50% less than graded or NM versions. Of course, we also would need to prove that Power is actually selling. Here is where we run into a bit of a problem. There are some important things to take away from these graphs. The most important is that when it comes to Power, the TCGplayer Market price—which is based off of previous sales—is typically much lower than the current selling prices. This implies that most sellers are asking more than what people are willing to pay. 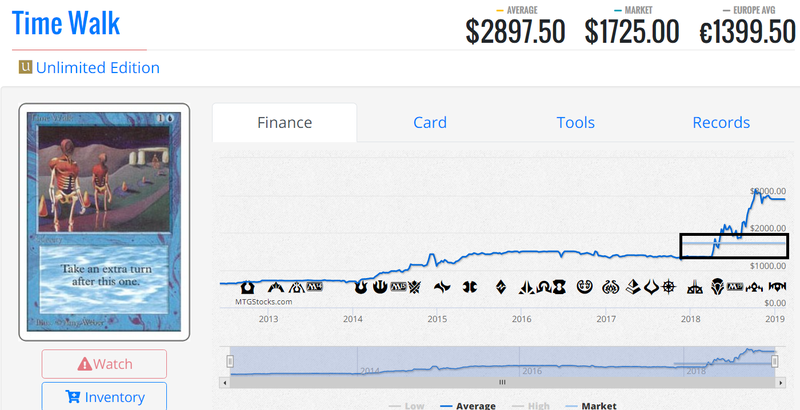 Also, quite noticeably, the TCGplayer Market price graphs are extremely flat. While I understand that Power isn’t likely something that changes hands all the time, many of these graphs show the TCGplayer Market price flatlined for months on end. That means that nobody is buying Power at these new, higher prices. It is important to note that TCGplayer is just one marketplace. Searches for Power on eBay sold listings do show some pieces are selling sporadically, which is interesting given the fact that TCGplayer has a fee cap of $50 while eBay does not. Though most of the eBay sales are significantly lower than the TCGplayer average price, except for graded Power, which we can safely attribute to the collectors’ market. If Power isn’t selling at these new prices, it seems reasonable to assume the prices are overinflated. Thus, buying Power at these prices is a poor investment strategy. Comparing the TCGplayer Market price and the TCGplayer median price, we see around a 15-percent difference. However, if you remove Mox Jet, which has an extremely high TCGplayer Market price of $3199.95, then the average difference jumps up to around 29%. It’s important to point out that the “average” price from the graphs above did not match up with the TCGplayer median price. Trading for overinflated Power is even worse, since your typical buylist prices on most cards fall to around 60-70% of the retail values. That means that if our fellow QS Insider was looking to trade into Power, they would have to give up a whole lot in order to shift to this “safe” investment. There are also some individuals and stores that are heavily invested in Power already who likely have a fair amount stocked up. Should any of them need to liquidate, they would have to drop the price considerably to achieve any sort of sales velocity. On the other hand, those who are heavily invested also have incentive to try to prop up the price in order to cash out when they decide to. Thus, they may create artificial demand by buying up all cheaper copies of Power; however, because the demand is artificial, when they do sell, the prices will drop. Another major concern I have with Power is that its value is so heavily influenced by scarcity. After all, we know the print runs of Alpha, Beta, and Unlimited. There are only 22,800 copies of each piece of Power (1100 Alpha Rares, 3200 Beta Rares, and 18500 Unlimited Rares) and another 15,000 of the Collectors’ and International Edition versions. Let’s not kid ourselves that there won’t always be people willing to counterfeit valuable goods—and the more valuable a good becomes, the more willing people are to make fakes for a quick buck. These cards were all printed in 1993 and are simply made up of cardboard and ink. While WotC did think ahead and provide some anti-counterfeit measures, these are not impossible to overcome with enough resourcefulness and desire. WotC has shown that they are smart enough to go after those who make counterfeits. However, when an item’s value is so heavily based on rarity, even a relatively small number of counterfeits hitting the market can tank the value. Given a typical Magic uncut sheet has 121 cards on it, for a counterfeiter to double the number of available pieces of power in the world, it would only require 189 sheets, which frankly isn’t that many. We have seen counterfeit problems pop up several times in the past five years, and there is no reason to think these people will stop trying. The QS Discord discussion regarding this topic was very interesting, and a fair number of members chimed in with their views and perspectives. I found myself very much in the minority. The purpose of this article isn’t to incite fear for those who do own Power. However, I recently finished a book by Peter Thiel, one of the co-founders of PayPal and a billionaire, that mentioned that if you want to be successful, look at the lie everyone else believes. In this case, that lie would be that Power is the best, safest investment in Magic finance. Obviously, that is my opinion. But even if I failed to sway you, and you still believe Power is the way to go, I hope this article will encourage you to reexamine some of your underlying assumptions. David started playing Magic in the days of Fifth Edition, with a hiatus between Judgment to Shards. He's been playing Commander since 2009 and Legacy since 2010. I think you are onto something. If everyone thinks power is a safe investment, then it’s not. Expectations are fully priced in so there’s no room for upside, etc. The only issue I have with this is that how many of these people have skin in the game? In this case that would mean people holding power or people getting ready to buy power. If most of the survey respondents and thread discussants don’t have skin in the game, then the forecast might be worthless. So, my answer would be, I don’t know! I don’t have have power and I don’t plan to buy power. What I do see is a need for renewal in the player base. More young people need to get interested for the top of the pyramid (power) to be maintained. I think this is possible but not guaranteed. It took me a long time to get clarity on this situation, but I believe the long term value is better served by abolishing the reserved list. Without continued interest by new players (which necessitates players actually being able to play with the cards) they will eventually become forgotten by all but the most enfranchised players. Reading and enjoying comic books does not make you want to own a specific comic book, but reading Superman might make you want to own Superman #1. Playing Magic does not instill in you the desire to own an original Black Lotus, but playing with a Black Lotus might. This effect can be seen with other Alpha cards that do not have the Reserved List protection such as Serra Angel or Shivan Dragon. Meh. This argument has been brought up so many times but its not something the community has control over. Wizards has been very clear that they will never abolish the reserved list. They have said this very publicly in many places. Let’s let this discussion die. It’s not going to happen. I agree with Ben on this one…at this point WoTC has explicitly stated on numerous occasions they will not eliminate the reserved list. Now, I could see them finding some wiggle room around their statement regarding the “spirit of the reserved list” (which sadly I wasn’t able to find a direct link to that statement, but have heard it repeatedly). The reserved list will not be reprinted with black or white borders. Doesn’t say anything about full art borderless (like unstable lands), or silver, or, hell, brown borders. If ever wotc gets into real financial trouble — like, bankruptcy financial trouble — you can expect to see the next set have a mox as a chase rare among box topper boosters. And if wotc still doesn’t reprint them — whoever buys the IP after the bankruptcy is a) not held by the RL promises in the first place and b) will definitely not repeat the mistake of abiding by it. Great article, thanks! If not power, then what safer segment would you recommend someone park their money for the longterm? If singles, any specific cards? If sealed product, any particular editions? Perhaps this spawns a “Part 2” of this piece, whereby you outline where you would put money and why. Would be interested to read your thoughts on this. Those formats are 93/94 old school and vintage and obviously only one of these is sanctioned. Those formats are played by folks in their 30s and 40s with spare income to buy iconic pieces of the game for the sake of slinging cards with their friends. These formats, and especially old school, represent a lifestyle choice for these older players. The card value is not pushed up by “tournament playability” as is the traditional basis for value in magic. It is a combination of vanity, nostalgia, and entrance into a community of people who are interested in playing magic in a place where drinks are served. The notion that more young people need to know about these cards for them to increase in value is not accurate. While that would help, the real driver of the market here is that old guys have money and want to live their childhood dreams. The other piece is that #mtgfinance speculators are able to consistently drive up the prices of old school cardboard with market manipulation tactics like buyouts. You speak to this in the article, and I think it’s a really important point. If the value is artificially inflated by speculators then a sell of could bring the price down. The other side of this is that, because of price memory, this would cause a lot of the actual old school player community to go out and buy those copies at the lower prices. If power dropped back below the $1k per mox ballpark, I would be a buyer simply because I know there is enough demand out there over the next 20 years to support it. More and more people are recognizing the awesomeness of old school. Player communities are cropping up in every major US city, and the format actually started in Europe where there is a huge demand for old school cardboard. Your argument titled “value heavily influenced by scarcity” is actually an argument about counterfeiting. While I agree that this is something we should always be concerned about, the old school community is very vigilant about this issue, as are all the card shops. Yes, there have been counterfeit scares over the past 5 years. Have any of them tanked the market? What’s changed? The community is even more vigilant. This will likely lead to greater difficulty for the counterfeiters slipping fakes into the market. Although the supply might become slightly increased by a couple of good fakes slipping in, I don’t think its possible for this to happen fast enough to cause a full collapse. Now, I don’t necessarily disagree with your entire conclusion. Sig has also mentioned that it’s unlikely that power will continue to grow at the rate it has. Almost impossible perhaps. I think there is a ceiling on how much the average old school player is willing to spend on power, and I think that’s the real limiting factor here. Can the average old school player justify spending in the 5 figures for a piece of cardboard? I think the answer to that is “probably not.” But, the other side of this coin is the recognition that there are 37,800 of each piece of power (the US old school community mostly allows CE/IE). Knowing that the card pool is finite, that these objects are treasured by wealthy people with demand as a type of luxury item. I thought we has reached the ceiling on power 10 years ago “How much can a piece of cardboard really be worth?” is a lingering question. Well, there are baseball cards valued in the millions, and you can’t play the best game ever created with them. These are the considerations that need to be taken into account when predicting this market. When we take this into account, I think the answer is pretty clearly in favor of Sigmund’s conclusion. Power might not have the highest upside, but it is probably the safest investment in magic you can make. Essentially, you are investing in the desires of a wealthy minority for a product with a very limited supply. I see where you’re coming from and the logic is sound, but only if we’re only looking at the short-term. Time is a constant and none of us are getting any younger. Yes, 93/94 is supported by a minority base of dedicated players, collectors, etc in their 30s-40s. Fast forward 10-15 years when this group of folks are watching their kids start college, preparing for retirement, etc; right now in America 1 in 3 baby boomers have less than $25k saved for retirement and overall 78% of people say they’re either somewhat/very concerned that they’ll outlive their retirement savings. There’s a non-zero chance many of those currently supporting the format as players or collectors will eventually look to cash out at some point in time. Now that’s not necessarily a bad thing in itself, but you have to wonder who will be buying those cards? Nostalgia is a powerful phenomenon that most Magic players/collectors can probably attest to. 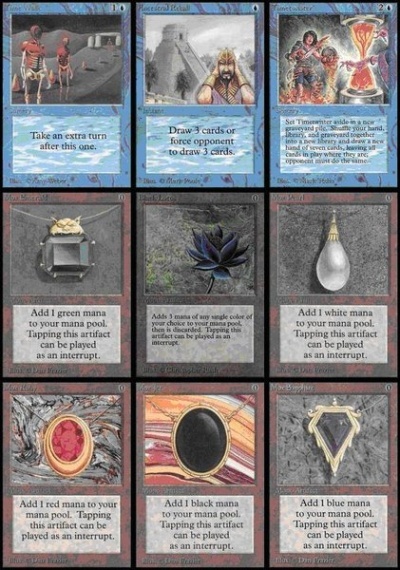 Due to limited supply and an already niche market, it’s rare that players today (or at any time in last decade really) get the opportunity to play with these cards and form those fond memories. Speaking as someone in his late 20s who started playing around ’98, I’m familiar with the games history and have a blast playing 93/94 on the rare occasions I get the opportunity. Still, there’s nothing that would compel me to drop an exorbitant amount of money on Power now or in the future. What I’m getting at is the next generation won’t be there to carry the torch. As the author pointed out, sales of Power are already few and far in-between. There’s nothing to suggest that trend will stop and or get better in time, save for prices falling. Using tcgplayer to benchmark prices for power seems like the wrong approach. And then to draw conclusions based upon it as the largest data point also is flawed. If you want to get a feel for the pulse of prices on power, then attend a large Vintage-focused event like Eternal Weekend, where multiple hundreds of thousands in cards are trading hands. You see some small amount of price inflation given the target audience, you also have buy prices that will match the growth. Also consider that every time the community has said that we’ve reached the ceiling on power (or duals for that matter), we’ve been proven wrong. and while I don’t disagree that some valuable data could be had by gathering information at a major eternal event, the fact that there are so few of them helps make my point. As you state, even then the prices may not accurately reflect true demand as you’ll have people there who have to pay inflated prices for convenience. But, if I can make it to one of these types of events I’d love to get additional data though I’m not sure what would be a good way to do so. Thanks Tark. I definitely think a part 2 article on where I’d suggest one park there money would be an interesting one to write. It is pretty amazing to think that there are only 22,800 sets of power out there. To see that number and then think about how many of those do not exist any more due to damage, thrown away, etc. As a collector this is definitely an empowering feeling.